Skimmed milk powder and buttermilk powder Uelzena supplies low heat and medium heat skimmed milk powder for chocolate and confectionery products. 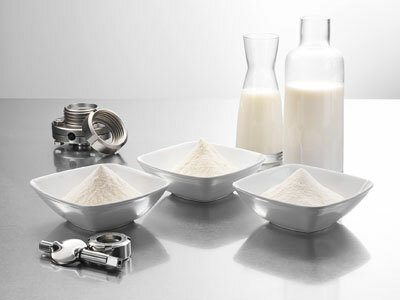 All milk powder variations are characterized by their balanced and still pronounced milk flavor and excellent processing properties they impart to confectionery and chocolate products. High quality skimmed milk powders with finely tuned properties, including the degree of denaturation, solubility parameters, low dusting properties, particle sizes and mixing behavior, are available. The gently heated and barely denatured low heat skimmed milk powder is perfectly suited for the recombination of milk and its further processing into yoghurt, cheese and fermented dairy products. The range is completed by a sweet buttermilk powder.